Part of the Nelson Bubble Lamp series, the Nelson Pear Criss-Cross Bubble Pendant has a pear shape that flares towards the centre, with criss-crossing lines in the under-structure that accentuate its curves. George Nelson originally designed the Bubble Lamp series in 1952. 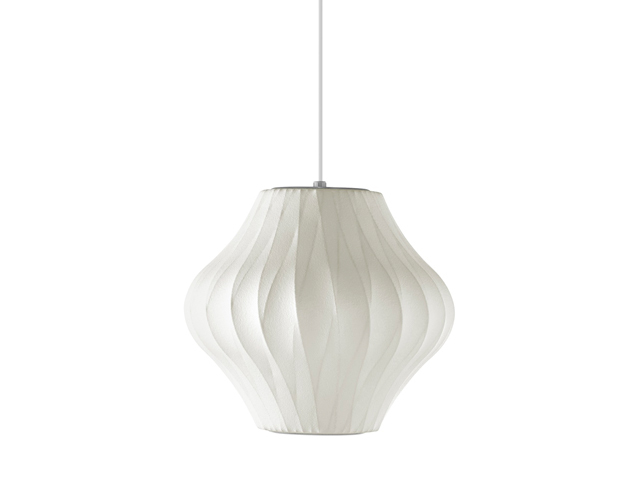 He was inspired by a set of silk-covered Swedish hanging lamps. A classic George Nelson design, the Nelson Bubble Lamps bring warmth to any interior with their various spherical shapes and soft, even light. The Nelson Pear Criss-Cross Bubble Pendant’s flared shape is further accentuated with a pattern of intersecting lines in its under-structure. It is available in two sizes, small and medium, each with a 6-foot cord, to illuminate spaces of different sizes. George Nelson designed the Bubble Lamps in 1952. He was inspired by a Swedish hanging lamp that he wanted to acquire for his office. The steep price tag, for that time, prompted Nelson to design his own, and the result was a series of lamps. Complete with a brushed nickel-plated steel ceiling plate.